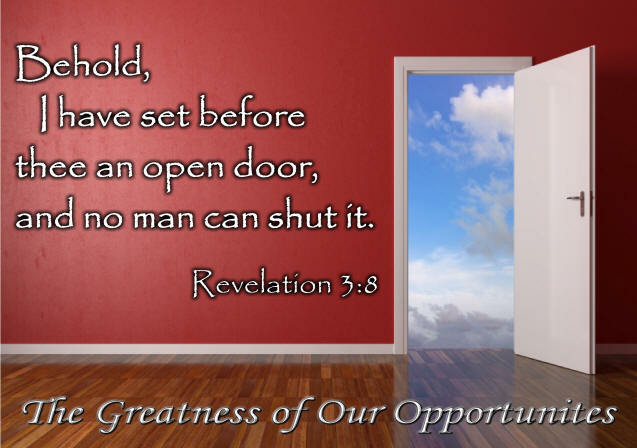 The door is open…are you? Salvation is not about escaping something, it’s about finding Someone. It’s not about jumping through the hoops of religion, it’s about accepting an open invitation to something both strange and absolutely wonderful beyond our ability to imagine. Because of what Christ has done, we’ve all been invited to participate in nothing less than His divine life (2 Pet.1:4). The New Testament bookends with this invitation. The very first thing Jesus preached publicly was to tell His people they needed a paradigm shift in thinking. The J.B. Phillips Bible paraphrases this more clearly than the traditional renderings. This paradigm shift is μετανοέω (metanoeō) in the original Greek. We traditionally translate this word “repent” in English. This is somewhat confusing because it sounds like re-penance, which is not what the word means at all (see my post, “A time to be re-formed” for further explanation). It’s fitting that Jesus makes this proclamation when John the Baptist was arrested. John represented the last of the Old Testament prophets. He represented the closing of one age; Jesus was the beginning of something altogether new. Jesus was telling His first century audience to open their hearts and change their mindset. They needed a new perspective. The Kingdom has come…stop thinking that God wants your bull and goat offerings and, instead, believe the good news that brings great joy. Paul said something similar to the Gentile philosophers in Athens…. As Robert Capon said, Jesus was announcing the end of our religion. The truth is, whether Jew or Gentile, God never really wanted our pagan-like sacrifices (Psalm 51:16-17; Isa. 1:11, 16-17; Jer.7:22-23). All He ever wanted from the beginning was our heart—to receive His overtures of affection, His other-centered, self-giving love, and then to walk in that same love toward others. This paradigm shift means moving away from trying to appease God with our religious scapegoating, and toward believing Him and living our lives in response to His love instead. So, what is this good news that brings great joy? The New Testament ends with the following invitation that expresses it beautifully. To understand how profoundly wonderful this invitation is, I ask you to suspend what you might’ve assumed about the Gospel for a moment. This is not talking about why Jesus went to the Cross, but what He accomplished for us there. See if what I’m saying makes sense. The qualifications are: whoever hears…thirsts…desires. If that’s you, the door is already open wide. Simply enter into the spacious life of God. You’ve been invited to drink freely of this life to the fullest extent of your heart’s desire. But if your heart is closed, then this door is closed. It’s closed to His life. But it’s only closed in your mind.